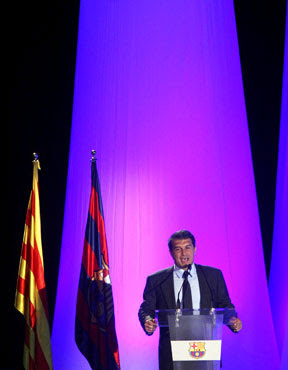 At the annual assembly of Barca socis on the 19th of August, 2009, amendments to the constitution of FC Barcelona were made regarding the terms of the president and the board. 86% of those present in the assembly voted for the extension of the term from the earlier four to six years. The president of the board may serve a maximum of two consecutive terms. The change in the constitution is in accordance with the decree of the Catalan parliament, which limits the terms for club boards and presidents from a minimum of six to a maximum of eight years. All the mandates of a newly elected board shall begin on July 1 and end on June 30. In the event of an early termination, the term of the new board shall also take effect from July 1 and the period in between will not be counted as one year. This was done to avoid situations like the one that arose with Laporta in 2006, when he was forced to call elections because his first eight days in office in 2003 were counted as one year as per the previous statutes. The reform also confirmed Catalan as the statutory language of the club and the Catalan citizenship as a necessary pre-requisite for presidential candidacy. Other highlights of the constitutional assembly include penalties for members who have xenophobic, violent or unsportsmanlike behavior. is laporta allowed to run again??? In theory, is it possible for Laporta to be the president in 2016? Somebody please clear my doubt: Whats the advantage in increasing the tenure from 4 to 6 ? and how is it going to be good for the club ? more than any advantage, it was a law that they were forced to comply to. The Catalan Govt had ruled that Presidents of clubs in Catalonia have to have Presidents for a minimum of 6 years. Its probably good for continuity at the club. So does that mean that laporta may continue for another term ? Laporta could not again be president but can run as vice-president for example. But he won't do that, because it would make the presidential candidate he backs look like a fool and because he just wants out and do other things (politics or business). This is the final year of Laporta. That cannot change. Rossell is the next one ?